This post is the second in a short series on the ethics of euthanasia. The series follows the pair of essays in the book Contemporary Debates in Applied Ethics . Right now, I am looking at Michael Tooley’s “pro” euthanasia essay. In part one, I outlined, in some detail, Tooley’s basic argument. 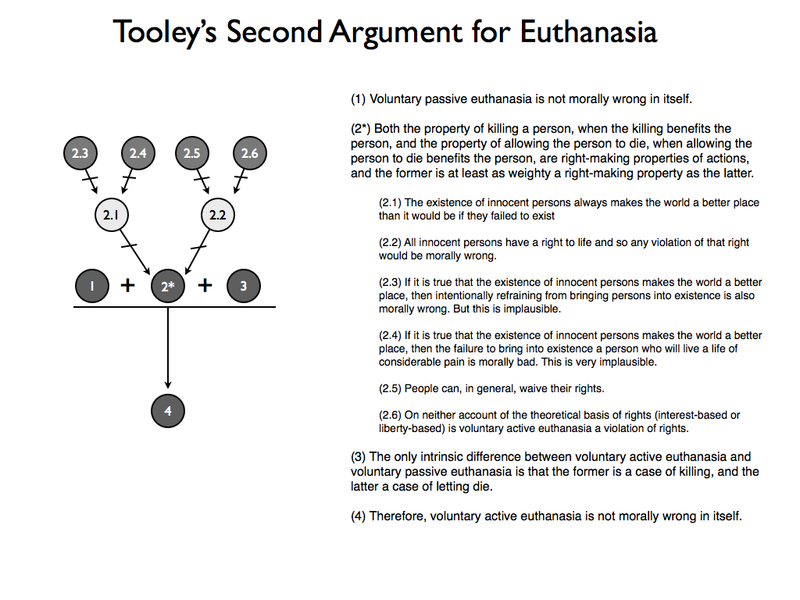 In this part, I’ll consider Tooley’s second argument, as well as his views on the legalisation of euthanasia. To understand Tooley’s second argument we need to bear in mind the different forms of euthanasia. As you recall from part one, particular instances of euthanasia can vary along two dimensions: (i) the voluntary-involuntary dimension; and (ii) the active-passive dimension. The first of these dimensions is concerned with the attitudes of the person being euthanised to their death (did they consent to it or not? ), while the second is concerned with the type of assistance offered to that person (does a third party act to bring about their demise or is their demise brought about through omission?). The most ethically contentious form of euthanasia is the voluntary active one. This form of euthanasia arises whenever a person A performs some action which has as its direct intention the killing of another person B, and B consents to this. Contrariwise, the voluntary passive form of euthanasia is relatively uncontentious. Most people seem to think it would be okay for B, in certain circumstances, to forego life-preserving treatments. The asymmetrical reactions to these forms of euthanasia opens up an intriguing possibility: if we can convince people that there are no morally significant differences between the active and passive forms of voluntary euthanasia, then perhaps we can convince them that euthanasia is morally permissible. This is exactly what Tooley’s second argument attempts to do. It tries to show that there are no good grounds for thinking that two cases are ethically different. Let’s see how he makes his case. (1) Voluntary passive euthanasia is not morally wrong in itself. (2) Intentionally killing a person and intentionally letting a person die are, in themselves, morally on a par. (3) The only intrinsic difference between voluntary active euthanasia and voluntary passive euthanasia is that the former is a case of killing, and the latter a case of letting die. (4) Therefore, voluntary active euthanasia is not morally wrong in itself. Premise (1) is likely to be accepted by most people, and premise (3) is just an implication of the definitions of active and passive euthanasia. This means that premise (2) is where the controversy might be thought to lie. Is it really true to say that intentional killing and intentional “letting die” are morally equivalent? Some philosophers are likely to argue that there are important moral differences between the two cases. In making their argument, they might appeal to the famous thought experiments involving organ donation. For instance, consider the following. You are doctor in a hospital with two patients, both of whom need organ transplants to survive (say one needs a kidney and the other needs a heart). As luck would have it, a healthy person who is a perfect match for both patients walks into your hospital ward. If you kill the healthy person and harvest their organs, you can save your two patients. Should you do it? Most people say “no” but this is puzzling if there’s no moral difference between killing and letting die. After all, if there were no moral difference then surely letting two patients die would be worse than directly killing another? (A) The property of killing a person and the property of allowing a person to die are, other things being equal, wrong-making properties of actions, but the former is a weightier wrong-making property than the latter. See what we’ve done here? We’ve acknowledged that killing and letting die are morally undesirable, but we’ve also accepted that the former is worse than the latter. This can account for our reaction to the organ donation case. (B) Both the property of intentionally causing a harm, and the property of intentionally allowing a harm to occur are wrong-making properties of actions, but the former is a weightier wrong-making property than the latter. Principle (A) would actually be derivable from (B) since (B) expresses the more general rule that harming is morally bad. The problem this creates is the following: in the euthanasia case the claim is that killing a person is not actually a harm to them but is, in fact, a benefit. This is why I included the clause “other things being equal” in my formulation of principle (A): the point being that in euthanasia cases “other things” (namely, the relationship between death and harm) are not equal. (C) Both the property of intentionally causing a benefit and the property of intentionally allowing a benefit to occur are right-making properties of actions, but the former is a weightier right-making property than the latter (or, at a minimum, is at least as weighty a right-making property as the latter). (2*) Both the property of killing a person, when the killing benefits the person, and the property of allowing the person to die, when allowing the person to die benefits the person, are right-making properties of actions, and the former is at least as weighty a right-making property as the latter. When plugged back into the argument given above, (2*) allows us to reach the same conclusion. But is it any less objectionable than the original version? Tooley thinks there is one plausible line of objection to the revised version of premise (2). This line of objection holds that the property of killing a person, even when the killing benefits them, cannot be a right-making property of an action since the direct killing of an (innocent) person is always morally wrong in and of itself. The “innocent”-caveat here is a concession to those who think that under certain conditions it is morally good to inflict capital punishment on a guilty person. To those who mount this objection to (2*) we must ask: what basis is there for thinking that killing innocent persons is morally wrong in and of itself? There are two possibilities here (according to Tooley). Appealing to axiology, we could argue that the existence of innocent persons always makes the world a better place than it would be if they failed to exist (2.1). Or, appealing to the notion of rights, we could argue that all innocent persons have a right to life and so any violation of that right would be morally wrong (2.2). The appeal to axiology faces two objections. First, if it is true, then intentionally refraining from bringing persons into existence is also morally wrong in the exact same degree. This is implausible (2.3). Second, looking at cases of people suffering considerable pain due to incurable illness, the proponent of the axiological appeal must believe that their continued existence is a net benefit to the world. But then should they not also hold that the failure to bring into existence a person who will live a life of considerable pain is morally bad? Again, this seems very implausible (2.4). The appeal to rights is also problematic. For starters, people can, in general, waive their rights (2.5). What’s more, the claim that the death of those who are suffering considerable pain due to incurable illness violates their rights is likely to be false. Why is this? Well, consider that there are two plausible theoretical bases for rights, either (a) rights protect individual interests or (b) rights protect freedom of choice. But in the voluntary euthanasia case, the claim is that death is either (i) in the person’s interests or (ii) something they desire for themselves. Therefore, on neither account is voluntary euthanasia a violation of individual rights (2.6). That gives us the following completed argument map. 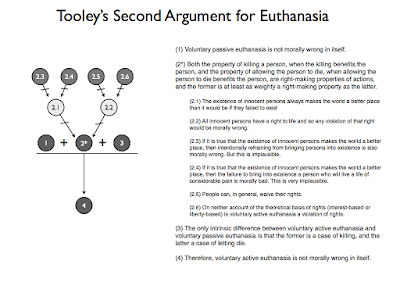 Through his two arguments, Tooley feels he has made the case for the moral permissibility of voluntary active euthanasia. But just because something is morally permissible does not entail that it should be legalised. For example, some people think that, under extreme circumstances, interrogative torture is morally permissible. But the same people do not necessarily think that the legal ban on torture should therefore be relaxed. Laws alter people’s incentives and these alterations may not be morally desirable. So before pronouncing on legal policy, Tooley considers three objections to the legalisation of voluntary active euthanasia. The first objection comes from Yale Kamisar. He argues that if voluntary euthanasia is legalised, some people will consent to being killed in cases in which their death is actually contrary to their own interests. Tooley is pretty quick in his dismissal of this argument. He argues that, unless the person is emotionally or psychologically disordered, there no reason to think they will fail to appreciate good reasons for their continued existence if such reasons exist. Also, he argues that this objection fails to distinguish between the active and passive forms of voluntary euthanasia. So if it’s a good objection to legalising the active form, then it’s also a good objection to legalising the passive form. That’s a problem for Kamisar since, according to Tooley, he accepts the latter. So much the worse for Kamisar, I guess. The second objection appeals to the notion of a slippery slope: if we legalise voluntary active euthanasia, what’s to stop us from legalising other undesirable things such as involuntary euthanasia? Kamisar also makes this argument. He justifies this by pointing out that advocates of voluntary active euthanasia often think that certain forms of non-voluntary euthanasia should be legalised. He also points to the historical experiences in Nazi Germany and suggests that some of the problems there were attributable to an initial acceptance of the proposition that there is such a thing as a life not worth living. And from there it was but a short slide down the slippery slope to racial extermination. There are many things that could be said in response to this. We can start by pointing out that there is a distinction between non-voluntary and involuntary euthanasia and that acceptance of the former would not logically entail acceptance of the latter. Turning to the Nazi case, we become embroiled in a dispute over historical causality. The claim that there was a slippery slope from the acceptance of one proposition about the worth of life to policies of racial extermination is certainly debatable. Some would argue that the ideology of racial purity and supremacy predated the acceptance of the claim that some lives are not worth living. And that this is a more likely cause of the extermination policies. Whatever the case may be, it seems that the Nazi experience is likely to have multiple, historically contingent causes, most of which will not apply to modern societies. Furthermore, in response to the slippery slope argument, we can point to empirical evidence suggesting that the slippery slope will not arise. The best set of evidence comes, of course, from the Netherlands which has legalised voluntary active euthanasia. The evidence from the Netherlands is controversial. Some (including Callahan, who we’ll talk about the next time) argue that the Dutch experience actually does provide evidence of a slippery slope because there have been cases of involuntary euthanasia there. Tooley disputes this, however, because it fails to contrast the situation in the Netherlands with the situation in countries which have not legalised voluntary euthanasia. He argues that when you contrast it with such a country (he uses the example of Australia) you find that there are more cases of involuntary euthanasia in the other countries. I’m a little bit wary of this empirical evidence because Tooley only compares figures over the years 1995-1996 (and he’s basing this on analyses done by others). I haven’t read this evidence and I haven't read any countervailing evidence either. Nevertheless, there is an interesting point here: regulation of an activity can sometimes lead to fewer rights-violations than non-regulation because people are suddenly made accountable for decisions which were previously carried out under the radar of the law. The third and final objection to legalisation is this: there is uncertainty about the form that legal regulation should take. 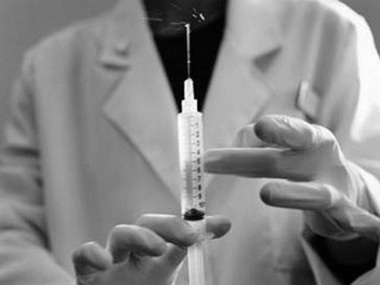 Should there be complex and stringent guidelines for those who carry out voluntary euthanasia? Or should there just be some general principles? If we opt for the former, then some people who might benefit from euthanasia might be excluded. And if we opt for the latter, rights might fail to be protected. Tooley’s proposal is this: First, we follow James Rachel’s suggestion and make voluntary active euthanasia a defence to a charge of murder or manslaughter (like self-defence). And second, we combine this with rather conservative and stringent regulation. The former would allow for a certain degree of flexibility, while the latter would protect against abuses. I have no idea whether this dual regime would work. My preference would be for complex and stringent guidelines since, acknowledging that errors will be made, I think we should err on the side of preserving life rather than ending it. This brings us to the end of Tooley's essay. In the next part, we'll look at the anti-euthanasia essay by Daniel Callahan.